September 11 brings forth many strong images, many burning memories. Facebook walls, Twitter feeds, posters and news shows invoked “Never forget” as a mantra for the day. 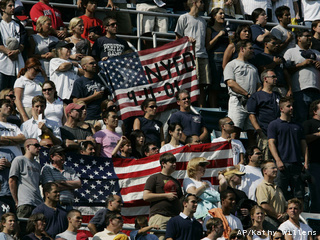 We will never forget the event, but the feeling of unity that followed 9/11 is surely forgotten by most Americans. I see evidence of that every day in the media, on Facebook and in the way we treat each other. And there is no bigger shame than that. In his most recent 9/11 address, President Obama said that we are “a people united like never before.” I believed in 2002 but not in 2012. United is about the farthest thing from the truth I could use to describe America today. From the hate and vitriol that is regularly spewed on news channels to the hate-laced arguments posted on Facebook among “friends,” I can’t even imagine that anyone would consider America united. 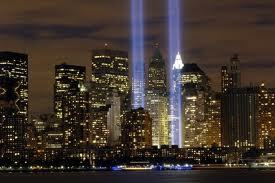 While I remember the smallest details of the day that the planes hit, I will also never forget the days following 9/11. I remember wandering in the streets at lunch hour on 9/12 and finding spontaneous church services of every denomination found in downtown Pittsburgh and people streaming in – believers and non-believers alike. It was mostly about being together in this moment that brought many into these powerful gatherings. I remember the first few times I had to fly for business. The friendly crew. The very friendly passengers. Talking with complete strangers in security lines, in the airport lounges and on the plane. Today I fly with amazingly miserable flight crew, passengers who want nothing to do with one another and people complaining about long waits in security. The difference is breathtaking. I’m not perfect. I let stupid stuff upset me too. But every day I try to take some of that “friendliness” that permeated society after 9/11 and bring it to my everyday life. Random acts of kindness may be a trite gimmicky phrase, but if everyone would actually embrace the concept once a month, once a week, once a day, imagine how much more pleasant our everyday life could be. So never forget. Never forget that evil lurks in the world and we must be ever vigilant. But never forget that a little kindness can go a long way toward the unity that existed in late 2001 and into 2002 — and that our leaders somehow think we all still have. Although I don’t remember why I was a little late for work, I remember with razor sharpness that when I walked into the office just before 9 a.m. on September 11, 2001 that the world had changed forever. “Did you hear,” a receptionist asked. Of course I hadn’t because I was walking from my car so I went straight to my office, turned on the radio – as we had no TV coverage in the office – and booted up my computer. Working in corporate communications, my day was then a whirlwind of getting in touch with staff spread throughout the nation, coordinating school closing announcements, and most importantly trying to reach our school in New York not far from the Towers. When the radio news began reporting a plane “heading toward Pittsburgh” I truly couldn’t believe it. Then I remember calls to my wife to get our daughter from daycare and get home and more work related calls, then watching the near gridlock of everyone in downtown Pittsburgh fleeing at once as companies closed. I didn’t know anyone who perished during 9/11 but I felt completely connected to those who didn’t come home. I had a job that required a huge amount of travel and could easily see myself on one of those flights, thankful that the plane was so empty so I had room to spread out. And I just couldn’t get that image out of my head. I still can’t. And I remember watching the skies later that day and for the next few days before air travel resumed. Strangest thing ever to see no planes flying overhead. As a former journalist and a PR guy, I’m a news junkie and when I finally returned home, I turned on the television to get caught up. But then I couldn’t watch. In fact, I didn’t watch any of the coverage for weeks. With a young daughter turning 3 in a few weeks, I used the Disney channel as my escape. For the first time ever, I just couldn’t bear to hear those stories, to get all the details. Lying in bed that night with our daughter between us – because we just wanted to have us all together – my wife and I wondered: What had happened to our world? What kind of world would our little girl grow up in? How would we go on? But we did go on. Call it human nature. But everything has changed. I remember getting on a plane for the first time just weeks after 9/11. I can picture that whole flight in my mind’s eye today. Also in my work world, I remember having conversations with my team that PR was going to be a different world for a very long time. When our New York culinary team revealed the heroic work it did to feed the rescuers, we decided to keep it to ourselves. Other companies were literally taking out ads in the New York Times to congratulate themselves. Others aggressively pitched stories shamelessly promoting the “good work” they were doing. It made me sick. I’m proud of my organization, which chose the high road instead. Sure we missed some amazing media coverage opportunities but we could all still hold our heads high. September 11 is a moment in time for all of us and what we take away is different for every individual. I’ve always tried to “live for the day” every day. Upon remembrance, it’s time to re-embrace that concept and make it my mantra – and if I can bring some others along with me, all the better.